South Africa is a golfer's paradise, with exceptional weather and magnificent golf courses located in areas of pristine beauty. When booking a golf holiday with African Sky, every leg and detail of your South African golfing getaway is organized by us. From accommodation and transport to course bookings and green fees, our intent is to provide a full package that will leave visitors wanting for nothing. Only the finest golf courses and accommodations are included in our itineraries. To ensure the most enjoyable and most comprehensive experience, our golf packages incorporate the most exciting regional attractions and highlights to tick off your bucket list. Play South Africa's top golf courses on an engaging private tour. Pick the courses and destinations that appeal to you most for a custom adventure. Cape Town and its surrounding areas are blessed with magnificent mountain ranges. The area is bordered by the Atlantic Ocean. This creates unique settings for picturesque courses, which range in style and character from true links courses to impeccably maintained parkland courses. The cream of the crop of the Cape Town golf courses include Erinvale Golf Club in Somerset West and Steenberg Golf Club on the edge of the Tokai Forest. Designed respectively by golf course legends Gary Player and Peter Matkovich, these courses offer world-class golfing experiences in spectacular environments. The Garden Route golf courses utilized by African Sky can only be described as breathtaking. 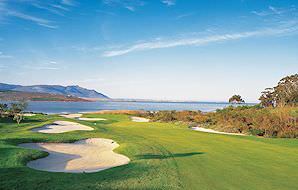 The golf courses found in the region include Fancourt, George Golf Club, Pezula and Simola - to name but a few. 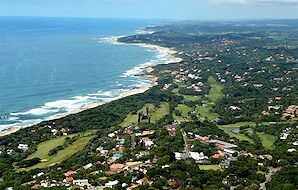 At least four of the top ten golf courses in South Africa are located in the Garden Route area. The temperate climate of the region merges with majestic mountain scenery and golden beaches to create a golfer's paradise. The area also offers a wealth of other attractions that may be combined with rounds on the Garden Route golf courses listed below. Notable attractions include nature reserves and fine sandy beaches. Gauteng golf courses are located in South Africa's economic heartland. The province includes both the major cities of Johannesburg and Pretoria. Though not as scenic as Cape Town nor the Garden Route, Gauteng does offer some exceptional quality golf courses. The best Gauteng golf courses - though certainly not the best in the country - may be considered Woodhill Golf Course in Pretoria and the East Course of the Royal Johannesburg & Kensington Golf Club. These courses have hosted various competitions over the years, including the South African Open and the PGA Championship. Kruger National Park golf experiences can be enjoyed on a range of fine courses which border the park or which lie not far from Kruger in the Lowveld region of South Africa. This is one of the only areas in South Africa where golf is best enjoyed during the autumn, winter and spring months. 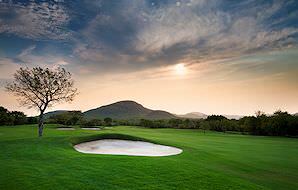 The most notable of the golf course in the region is Leopard Creek. This course is often ranked as South Africa's finest and is a must when planning a Kruger Park golf experience or golf holiday in South Africa. 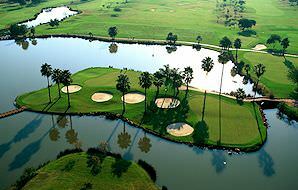 It has been described as 'the Augusta of Africa', and is sure to challenge and delight golfers of all skill levels. KwaZulu-Natal is one of the top golf destinations in South Africa, with over seventy golf courses to choose from. For golfing purposes, the province can be divided into four main regions, namely Durban, the South Coast, the North Coast and the Midlands or Drakensberg region. The most notable courses are San Lameer, the Wild Coast Sun and Southbroom on the South Coast. On the North Coast, Mount Edgecombe, Prince's Grant and Zimbali are sure to provide challenging rounds. In the Drakensberg region, Champagne Sports Resort offers the finest round of golf and, in Durban, the Durban Country Club is a must when enjoying a golf holiday in this part of South Africa. Two golf courses of exceptional quality are found at the Sun City Resort; The Gary Player Course, which hosts the annual Sun City Nedbank Golf Challenge, has for many years been regarded as one of the top golf courses in South Africa. The Lost City Course, though not as famous as the Gary Player, is a bushveld course which offers some unique features, including a water hazard which is home to a number of crocodiles. Pecanwood Country Club is located a little closer to Gauteng. All of these courses are meticulously maintained and offer play in superb bushveld surroundings. Why Choose South Africa for Your Golf Vacation? South Africa is home to more than 500 golf courses, ranking within the Top 20 countries with the most golf courses. The vast majority are championship courses, often boasting renowned international designers or the patriotic stamp of golfing legends closer to home, like Ernie Els and Gary Player. The gist of it is that you have the cream of the crop to choose from when golfing in South Africa. Few countries can rival the diversity of golf course settings that South Africa boasts. For example, you can tee off from a clifftop overlooking the blue expanse of the Indian Ocean, or you could relish a round alongside the Crocodile River that forms the southern border of the Kruger National Park, within view of elephants, giraffes, hippos and more. While your holiday may focus on a first-class golfing experience, that does not mean you should miss out on regional highlights like a Big Five safari, a trip to the top of Table Mountain, or a tasting tour of South Africa's esteemed winelands. Advise us of your preferences and we will ensure that your visit to South Africa is as comprehensive and unforgettable as can be. When playing on the courses near or in the Kruger National Park, it is not uncommon for wildlife - typically plains animals like antelope, zebras, giraffes or warthogs - to wander onto the course. While this is a very exciting prospect, remember to never approach or feed any wild animals. It happens to the best of players, but you'll be sure to find the refreshments and the handsome settings of the courses' 19th holes to have quite the successful remedial effects. There is, of course, also the satisfaction of the stepping up to the challenge, regardless of whether or not you were fit to conquer it. The defining factor of South Africa's golf courses is their spectacular settings. Wherever in the country you are enjoying your round, you will find that the views are sensational. This is particularly true of the Garden Route's clifftop fairways, and the wilderness stretching north of Leopard Creek. What golfing-related costs are included in my golf tour? Green fees are standard inclusions in your golfing package. Should you require club hire, cart hire or a caddie, additional costs will apply. What time will I tee off? Unless guests request otherwise, we aim for morning starts around 7am or 8am. This ensures that play is conveniently concluded in time for lunch and guests are able to spend the afternoon at leisure or taking advantage of a regional activity or attraction. What is South Africa's top golf course? According to the Top 100 Golf Courses List and Golf Digest, at the time of writing, the prestigious Fancourt Links in the Garden Route retains the top spot as South Africa's finest golf course. Are any major golfing events hosted in South Africa? Yes - the South African PGA Championship, along with the South Africa Open and the South African Masters form the 'Triple Crown' of South African golf. 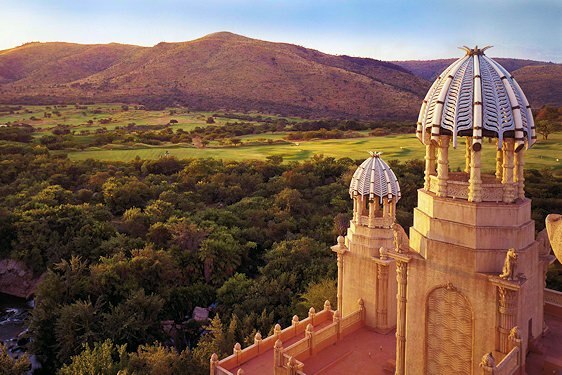 Another major event is the annual Nedbank Golf Challenge at Sun City. Where is South Africa's toughest hole? The 'Extreme 19th' at the Legend Golf Course in South Africa's Entabeni Safari Conservancy consistently ranks amongst the toughest holes in the world. Players are ferried up to Hangklip Mountain by helicopter to reach the tee, which is 400m above the green. If you can make the Par 3 in one shot, the resort offers a $1 million prize. Who is South Africa's most famous golfer? The legendary Gary Player is not only South Africa's most famous golfer, but is inarguably one of the greatest players in the history of golf. Player has designed numerous prestigious golf courses across South Africa, including Erinvale near Cape Town, Leopard Creek on the fringe of the Kruger National Park, the Fancourt trifecta in the Garden Route and, of course, the Gary Player Country Club at Sun City. Will I play golf every day of my trip? This depends on you. As we pride ourselves in our flexibility, all our tours are customizable to complement the needs of every particular client. Should you wish to intersperse golf days with leisure or alternative activity days, simply let us know your preference beforehand. Paying additional fees for sporting equipment or abnormal luggage can become a costly affair. However, if you are an avid golfer and plan on playing some of the top courses in the country, it may be worth it to be bring your clubs along rather than paying extra for rentals. If I only visit one destination for golf, which should it be? Home to five of South Africa's Top 20 golf courses, the Garden Route offers the widest variety of illustrious championship golf courses in the country. What is South Africa's oldest golf course? 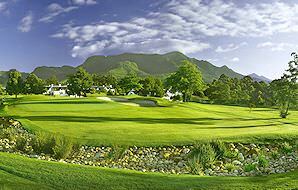 The Royal Cape Golf Club in Cape Town was established in 1885, which makes it the oldest golf club on the continent. Botswana's legendary safari areas include the Okavango Delta and Chobe. Namibia is known for dramatic scenery and exhilarating desert safari activities. Zambia's far-flung safari areas and enchantingly primeval and undeveloped. Zimbabwe's main drawing card is the breathtaking sight of the Victoria Falls. Mozambique is the ultimate beach and island vacation destination. For the ultimate in both relaxation and adventure, opt for an African beach vacation to Mozambique, South Africa or even Namibia. No experience will ever prove more memorable to you and your family than a family vacation in South Africa with African Sky Safaris & Tours. Visiting a remote wilderness area does not mean that you need to 'rough it' - Southern Africa is home to a plush proliferation of luxury safari lodges. Take the scenic route by opting for a luxury train journey. Popular routes include Pretoria to Cape Town and Cape Town to Victoria Falls.